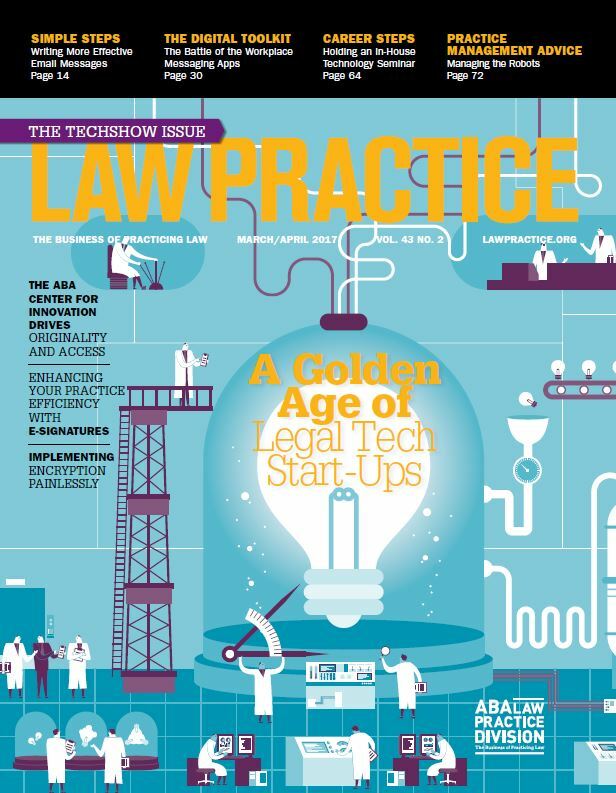 Hot off the presses is the latest issue of Law Practice magazine, which is the annual Techshow issue. I wrote this month’s cover story, A Golden Age of Legal Tech Start-Ups, which highlights some themes about start-ups that will be familiar to regular readers of this blog, but which also highlights a unique event happening at Techshow this year, the first-ever Startup Alley and startup pitch competition. This year, a dozen startups were selected to show off their wares in a special Startup Alley section of the Techshow exhibit hall. In addition, the 12 companies will face off in an audience-judged pitch competition. The pitch competition takes place on the opening night of Techshow, Wednesday, March 15. It will be held in the exhibit hall from 6:30 to 7:15 p.m. as part of the arrival reception. I will be moderating the competition, with help from Evolve Law cofounder Mary Juetten. The Law Practice article highlights the companies that will be taking part in the competition and some of the others that were among the finalists. So check out the article and, if you’re attending Techshow, be sure to drop by Wednesday night’s event.